Direct Drive Design delivers high speed operation in both directions, even under full load. Machine Cut Bronze Worm Gears provide accurate operation and long lasting service. 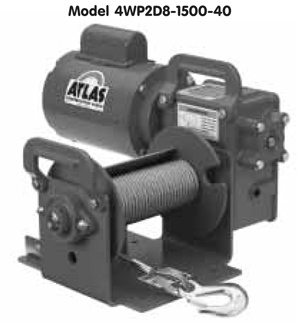 Pressure Plate applies pressure to drum and wire rope to help maintain uniform winding. Not available on clutch models. Diam Line Speed (fpm) Drum Cap. (ft) Appx. ‘ Actual drum capacities 25-30% less, due to nonuniform winding. Wire rope tension will also affect drum capacity. Weight may vary with motor. F All other voltages — please contact factory.